It has been the cry of householders though the ages as they wade through a pool of something indescribable. But an exhibition in Paris sets out to show that toilet facilities in the Middle Ages may not have been as primitive as previously thought. To prove their case, the curators have put on display the city's oldest water-closet, which was used by the de facto King of France between the years 1409 and 1413. 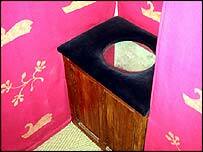 John the Fearless had a toilet that enjoyed all the facilities that the technology of the day had to offer. Situated at the top of the tower that bears his name in the city's second arrondissement, the lavatory of Jean Sans Peur Duke of Burgundy has a padded seat, chimney heating and a system of air circulation for odour combat. It also has a 25 metre shaft descending from the ducal bowels to those of his palace, where a stone-lined septic pit can still be observed today. The stone is worn into urine-streaks. The pit had a permeable floor to allow liquids to drain and solids to settle. These would then be removed periodically by a tradesman who went by the nickname Monsieur Fifi. "It was state of the art. The pit was covered to stop smells filtering upwards. On the street of course the filth was everywhere but in the homes of nobles, cleanliness was paramount," said Daniele Alexandre-Bidon, a hygiene specialist at the School for Higher Studies in Social Sciences in Paris. Lesser mortals of course had less sophisticated apparatus - also based on the principle of sending faeces into free-fall, but this time into the open air. Some were no more than holes built into the wall, others were primitive outhouses perched with wooden supports onto an upper story. A series of mediaeval illuminations at the exhibition shows that accidents in these contraptions were common. 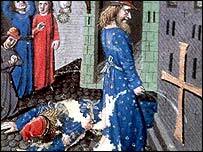 As for wiping material, John the Fearless had the advantage of a supply cotton and linen rags. 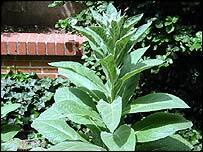 Ordinary people used a plant known as common mullein, whose leaves - though hardly absorbent - were pleasantly soft. An example grows in the tower's garden for visitors to test. 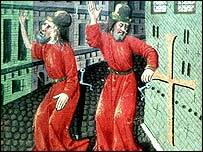 "Hygiene in the Middle Ages" has plenty of other interesting information about how our ancestors kept themselves clean. Soap came in two kinds - black and white, coral and cuttlebones were used for teeth, shampoo was made from fern-ash, vine stalks and egg-white - and after the Crusades the novel idea of all-body depilation took on. Medieval source books quote a recipe of quick-lime, bean-flour, urine and sulphurate of arsenic as a useful hair-remover. Modern-day doctors say don't recommend it. "In the Middle Ages using water on the body was seen as a source of cleanliness and purity - literally as well as religiously," said Alexandre-Bidon. "It was only much later that a different mentality arrived which feared exposure to air and water, and believed the body's goodness had to be heavily protected from outside elements," she said. Perhaps this explains the generally recognised decline in French hygiene standards in subsequent centuries. In the court of the Sun King in Versailles for example courtiers were reduced to squatting in corners because of the lack of facilities. In the early 20th century Parisian women were renowned for their foul odour, which they covered up with copious amounts of perfume. This was largely an architectural problem, with old buildings being divided up into scores of apartments to accommodate the burgeoning masses. Even today some Paris toilets are equipped with narrow gauge out-flow pipes, requiring a kind of mechanical device to churn up the offending material before its ejection.